Mamma Dear was a race horse who was forced to run until she could not walk. 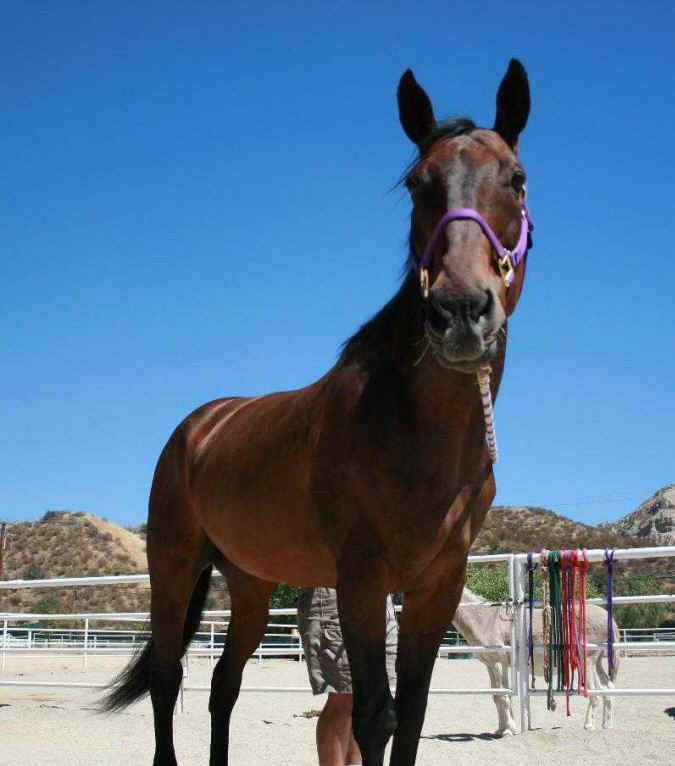 It took almost a year to heal her broken body, but after special shoeing, massage therapy and diet, she made a full recovery here. She adopted a donkey as her own baby, had a best horse friend named Cinnamon Apple Pie, was visited by a special person who loved her and was very much a diva here; happy and in charge. Seven months ago when we brought her in from pasture for dinner, she was limping and her right hind leg was swollen like a tree trunk. She could barely stand and would not eat her dinner, so we called the emergency vet. The vet diagnosed cellulitis which is very common in large horses who have worked very hard, like jumping and racing horses. The vet gave her intravenous fluids, pain medication and antibiotics, and told us that was all we could do. It seemed to make her a little more comfortable, so at 1:00 a.m. we all got some rest. Over the next several days, the swelling in her leg went down but her pain seemed to increase. We gave her massage therapy, chiropractic care, energetic healing, all to no avail; the pain kept getting worse. The vets were very concerned and they started thinking that it was time to put her down. But before we did that, we wanted to try everything, so our last resort was acupuncture. Mamma Dear barely made it over to the treatment area leaning, wobbling and almost falling over, and 20 minutes later she walked out straight as an arrow! The acupuncturist came back several more times and Mamma Dear continued to improve. The swelling was down, her back was straight, she was eating and walking fine and it was time for Mamma Dear to join her friends out in pasture. Her donkey and best horse friend were thrilled and they ran around together and played. Mamma Dear continued to do well for 7 more months with the continued support of meds, special shoeing, ultrasound, massage therapy, energetic healing and chiropractic care. But last week she crashed again. Her legs seemed so weak. She was leaning to one side and spinning in circles in an effort to stand, so we tried acupuncture again. But this time our tricks had no affect and did not help her. We were out of ideas. Friday evening Jay and I, Mamma Dear's special person and her family and some core volunteers gathered to say goodbye and ask her to leave a body that didn't serve her anymore. We could not watch her suffer any longer. We would like to thank Mamma Dear's special person, Jessica, and her family for showing her so much dedication and love, showing her that she was important, bringing her treats and loving her until the end! We would like to thank Mamma Dear's chiropractors, Dr. Michael Reuben and Dr. Meisinger, her ultrasound specialist, Dr. David Reuben, and her shoer, Rich Wechsler, for making her comfortable and giving us more time with her. We would like to thank Aldo, Rene, Manuel and Danielle for taking such great care of her and always giving her medications on time! We would like to thank every volunteer who groomed her and made her feel loved and shine like the super star she was! And thank you to all our visitors who gave her a carrot and were a part of her life here. Mamma Dear, we will always love and remember you; you will always be our super star! We'll miss you but know we'll see you again over the rainbow bridge.